Part 1: What is iOS 12? Part 3: Is iOS 12 Stable? Should I Update to iOS 12? 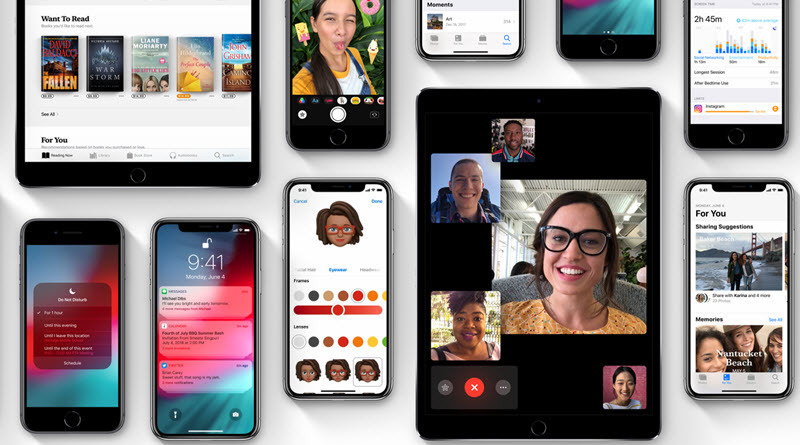 iOS 12 when finally released will be the twelfth major release of the iOS mobile operating system developed by Apple Inc. to succeed iOS 11. This software was officially announced to the public at the Apple’s World Wide Developers Conference (WWDC) on June 4, 2018.
iOS 12 is not very different in aesthetics from iOS 11, but it’s an upgrade in iOS 11 performance, battery-saving updates, security and few added functionalities to some apps. Moreover, every iOS device that supports iOS 11 will be able to support iOS 12.
iOS 12 features can be divided into two groups: System features and App features. We shall be discussing the new features of iOS 12 within these two broad categories. Performance: iOS 12 will be faster and more responsive than iOS 11 in the degrees: 40% faster app launch, 50% faster keyboard display, 70% faster swipe o camera, etc. Screen Time: You can know how much time you spend on your device and what you spend more time on. Shortcuts: You can set shortcuts and easily ask Siri to perform them. ARKit 2: ARKit can now track 2D images and detect 3D images too. CarPlay: You can run third-party navigation apps on CarPlay. Messages: Customizable “Animoji” called “Memoji” which allow you to create the 3D character of yourself will be available on the Message app. FaceTime: FaceTime will be able to support conference calls between 32 people. Measures: This AR app will allow you to take a true measurement of objects. Notification: notifications are well grouped with a “managed” tab. Is iOS 12 Stable? Should I Update to iOS 12? From the test we carried out on iOS 12 public beta 4, we can conveniently say that iOS 12 is stable. Therefore, if you’re considering taking the plunge into iOS 12 and ditching your iOS 11.4, then we recommend you run the iOS 12 on your iPhone, iPad or iPod touch when it’s officially released this fall. What Should I Do to Prepare for iOS 12? Before downloading and installing iOS 12 on your iPhone, we recommend you do the following needful preparatory task so that you can get the best experience with iOS 12. It’s a fact that iOS 12 will support every device that supports iOS 11. But for older devices, having storage space to do more with your new iOS may become an issue, and this restricts your iOS 12 experience and compel you to buy a newer model of iPhone. Hence, you’ll need software that can help you create or recover more storage space on your iPhone. 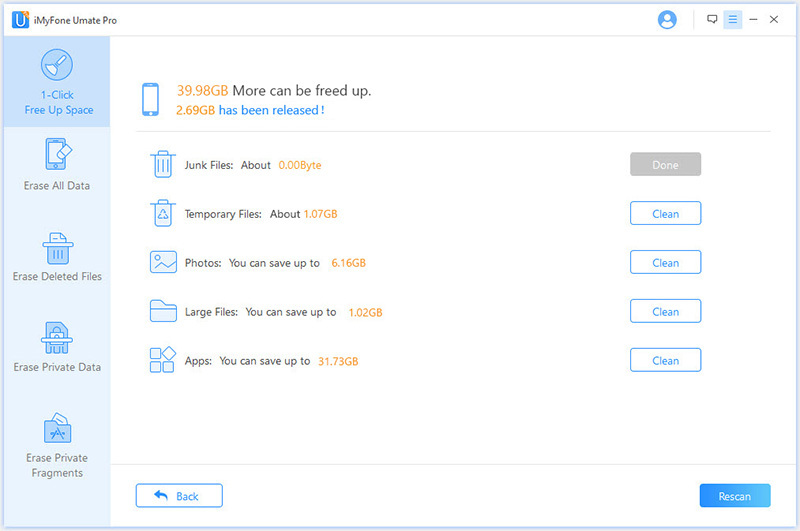 iMyFone Umate Pro for Win or for Mac can help you recover iOS device storage space occupied by redundant files, large and old apps, photos, videos, music files, voice memos, documents, and deleted files. 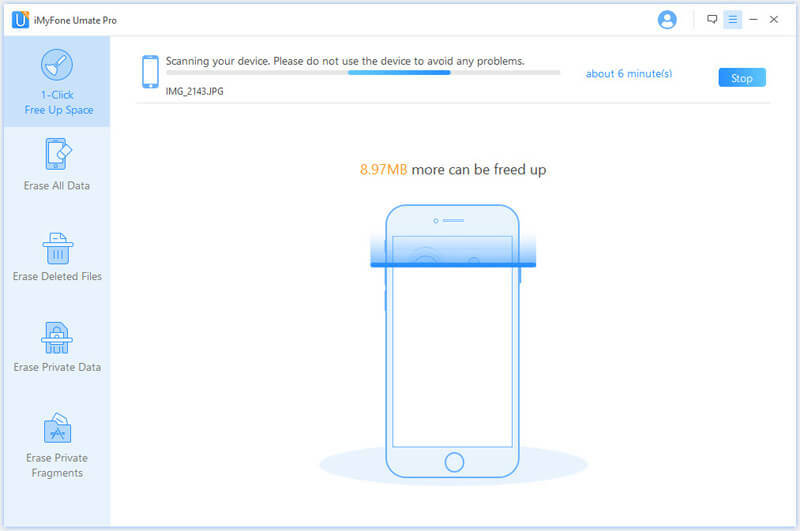 Umate Pro is the primary PC-based app for recovering iPhone memory space. Scan and detect useless files in iPhone, and delete them to recover iPhone storage space. Erases iPhone private data with 0% chances of recovering the deleted data. Backs up original copies of iPhone photos, and compress them losslessly to reduce file size and retain image quality. Photo including HEIC can be transferred to computer and external hard drive. Detects and erases deleted files to reclaim iDevice storage memory. Step 1: Connect your iPhone to your PC using a USB cable after downloading and installing iMyFone Umate Pro on your PC. Step 2: Scan your iDevice for space saving analysis by choosing “1-Click to Free Up Space”. Then tap “Quick Scan”. Step 3: After scanning, you can click the individual buttons to free up space. You can easily backup your iPhone, iPad or iPod touch via iTunes so that you have a copy of your data safely backed up should in case iOS 12 update ruins your iPhone data or causes partial loss of data. Step 2: Launch iTunes on your PC. Trust the computer when iPhone request for it. Step 3: Select your device on iTunes. You can save your Health and Activity data on iTunes by encrypting it first. Just select the box called Encrypt iPhone backup and make a password. 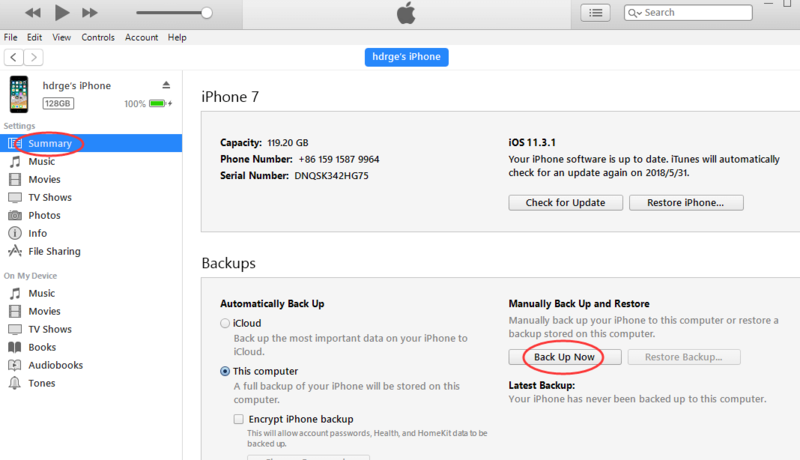 Step 4: Click “Back Up Now” tab to start backing up your iPhone on iTunes. You can check if the backup completed successfully by clicking “iTunes Preference > Devices”.